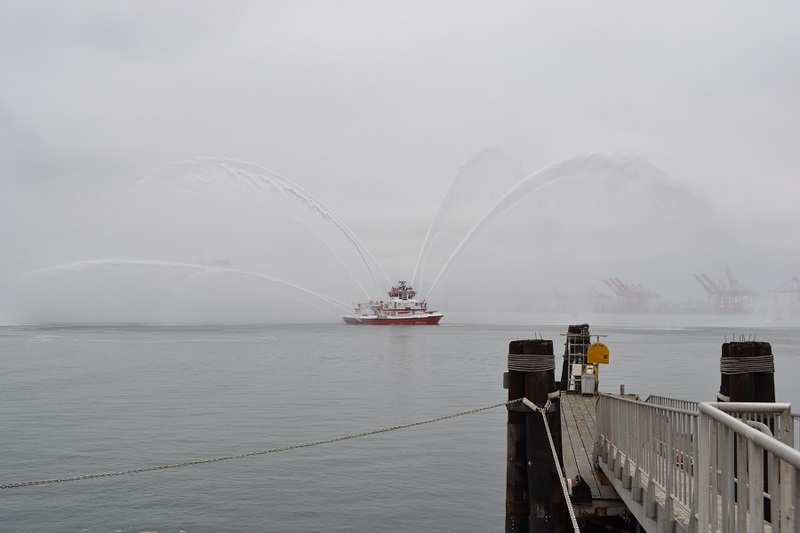 Standing at 35 feet tall and 108 feet long, the fireboat— the world’s most advanced—can spray 56,000 gallons of water per minute, according to LBFD Capt. Larry Coot. The department’s older models pump out up to 18,000 gallons per minute. Using its 10 water cannons, Protector can reach as far as two football fields and higher than a 20-story building, meaning that it can throw water or foam from anywhere aboard the world’s largest container ships and oil tankers, like the mega ship Benjamin Franklin, which made its appearance at the Port of Long Beach (POLB) earlier this year. Slangerup said Protector can fill up a backyard swimming pool in 20 seconds. “Protector” was dedicated in memory of former LBFD Capt. Donald Domenic DiMarzo who served during WWII and was killed while leading efforts to save an aircraft carrier after an attack in 1944. He was posthumously awarded the Navy Cross for his efforts. The fireboat can assist with chemical, biological, radiological and nuclear threats, port officials stated. It features facilities for medical treatment, a command information center, boom deployment to contain spills and an onboard 50 foot crane. The vessel, manned by six crew members, can also hold up to 200 people in case of a catastrophe. “We have to be prepared for any potential hazard,” Harbor Commission President Lori Ann Guzmán said. “Protector is a major improvement in our emergency response capabilities, helping us to safeguard both the Port and our community. LBFD Chief Mike DuRee said following 9/11 the LBFD set out to build new requirements for vessels, including firefighting ships, water rescue, dive support, towing, harbor security patrol and disaster response. “Protector was designed and developed with these requirements in mind,” DuRee said. DuRee said a second fireboat, Vigilance, is scheduled to go into service in 2017, and together the fireboats are considered the most powerful and sophisticated fireboats in the world, replacing the port’s two vintage fireboats, Liberty and Challenger. The construction costs of both new boats combined is $51.6 million, including an $18.5 million grant from Homeland Security and FEMA.